Astilbes are a gorgeous plant to bring colour and texture to darker areas of the garden as they are one of the few plants that bloom brightly in shade. They also like moist soil conditions which makes them suitable for waterside areas or boggy conditions. The feathery plumes of flowers come in a range of colours from deep red, to pinks, lavenders and white. Each spire is comprised of many tiny little flowers which open one after another. These plumes are between 6 inches to 2 feet (15 – 60 cm) long. Astilbes will tolerate a wide variety of conditions and as they are hardy and come back year after year they provide good-value colour and interest to the garden. They look good grown as single plants, or clumps and are great companion plants in a border. They work particularly well with other shade-loving plants such as hellebores, hostas, ferns and grasses. Astilbes are easy to grow and propagate. Maintaining them is also easy as they simply require trimming back in early spring. Different varieties flower at different times, which means you can have them flowering in your garden from late spring through to early autumn if you combine varieties. Astilbes also make good cut flowers if you wish to bring some blooms indoors. This article will tell you all you need to know to propagate, plant and care for this colourful, shade-loving gem. There are a wide variety of astilbes available. They range in colour, height and flowering time. You can use different plants in order to have colour in the garden from spring until autumn. Their differing heights means they are useful for many areas of the garden from the back of the border to containers in seating areas. The following varieties have particularly good foliage and flowers. Remember, it’s wise to check the heights of astilbe varieties before you buy, especially if you want them for a certain part of the border, as they vary considerably in size. This variety has an RHS Merit award. Its dark green foliage is topped with crimson plumes of flowers. It flowers in early summer and reaches a height of 60cm. ‘Irrlicht’ or ‘Moonlight’ is a creamy-white flowered variety with dark emerald leaves. It blooms from May to July and reaches a height of 50 cm. Also known as false goatsbeard this variety is another with an RHS Merit award. The plant has bright green foliage and large plumes of tiny pale pink flowers. This is a slightly taller variety reaching approximately 90 cm. It flowers from June to August. ‘Brautschleier’ or ‘bridal veil’ has lacy spires of white flowers. It reaches a height of 70cm and flowers in June and July. This variety is also RHS merited. This variety has mauvy-pink flowers and mid-green leaves. It flowers from June to August and reaches a height of 120cm, so is perfect for the back of a border. This is a gorgeous variety with dark bronzed leaves and corally pink plumes. It flowers from June to August and is a smaller plant reaching an ultimate height of just 25cm. Astilbes require a semi-shaded location in soil that does not dry out. Smaller varieties can be grown in containers but will need regular watering. The plants are perennials and will come back year after year. Most are hardy and will tolerate freezing conditions and snow. The plants will cope with most soil types, including acid soils, as long as the soil is not dry. Most astilbes prefer semi-shade. They do not tolerate direct sun at the hottest part of the day. They do need some sun to flower well, but this can be as little as an hour of dappled light each day. This makes them the perfect flowering plant for shady conditions. As woodland plants, they do need to be kept moist and will not tolerate drying out especially if they are in full sun. They will do well in relatively boggy areas of the garden such as by ponds and streams. However, if they are well watered they will manage in most conditions. Astilbes are suitable for all soil types, including acid soils, the only exception is dry soil. Some varieties will do okay in sandy soil as long as they have shade. If the soil is poor, dig in organic material, such as compost, to a depth of at least 20cm before planting. A mulch will help the roots stay cool and moist. Refresh the mulch yearly. The mulch helps retain moisture and provides a natural fertilizer as it breaks down. A granular slow release flowering perennial fertilizer may be applied in spring to ensure plentiful flowers. Phosphorus will help the plant bloom well so choose a 5-10-5 or 10-10-10 fertiliser (the middle number is the phosphorus ratio). Astilbes do not need pruning. You can, however, tidy back the plant as required and cut back any old growth as the new growth begins to appear in spring. Astilbe is often sold bare-rooted in the early spring. If you buy these plants, make sure you get them in the ground as soon as possible after buying so that they do not dry out. Keep them wrapped in moist newspaper until you can plant them. The plants will thrive in moist, humus-rich soil. Add potting compost or organic matter if the soil is poor. When planting, ensure the hole is twice as wide as the plant and 6 inches (15 cm) deep. Fan out the roots into the hole and make sure the crown is an inch (2.5 cm) or so below the ground. This will prevent it from drying out. Backfill the hole and water well. Applying a mulch will keep the roots, moist, provide nutrients and repress weeds. If you are planting astilbes that have been divided, you can plant them either in spring or autumn. Plant these 1-3 feet apart, depending on the variety. After 3 to 4 years your plant may become overcrowded and congested. At this point, you can dig up the plant in late summer and divide it, then replant the divisions or put them in pots until they are more established ready for planting out in early summer of the next year (see Propagation for details on how to do this). If you have an astilbe that is not thriving, and you think it needs a change of position, the best time to transplant it is in late summer or autumn. You can also divide the plant at this time if necessary. Smaller varieties of astilbe can be grown in pots. They are useful for adding a splash of colour to a shady patio or seating area. Be careful that they are not in full afternoon sun as they will dry out and die. A little, dappled sunlight each day will help them flower, though. Plant in a large container with good quality potting compost. Keep them well-watered as they hate having dry roots. During the growing season, a fortnightly application of soluble fertiliser will keep them healthy and flowering well. The essential thing to remember with astilbe is to keep them well watered and out of strong sunlight. Unlike many flowers, removing flower heads will not result in more flowering. In fact, many people like to leave the seed heads on as they add extra interest and texture to the garden. Even after flowering is finished your plant will continue to provide attractive foliage. After the first frost, the leave will begin to turn yellow. You can cut back the plant at this time to keep it tidy or you can do this in spring when the new growth begins. Astilbe can cope with very cold weather. However, there are a few things to do ensure this is the case. Firstly, the plants hate to dry out, so continue watering them until the ground freezes. At this point, apply a mulch to the plant to help it cope with the cold. While many people leave the dead flowers stems as winter interest they can be cut back to 5 cm above the soil in order to make it easier to apply a mulch. While you can grow astilbe from seed they are difficult to germinate so most people buy the plants. Luckily, though, like most perennials, your plant will soon grow into a big clump and after 2-4 years you can divide it and produce several lovely plants. Division is by far the faster of the propagation methods and will result in plants the following season. 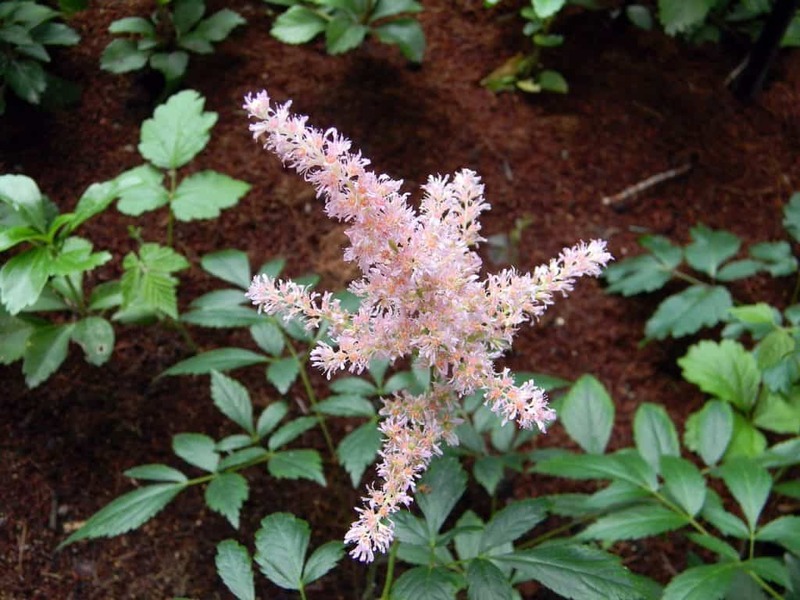 It is beneficial to divide astilbe to prevent overcrowded roots. The roots in the centre of the plant begin to suffer from lack of water and nutrients if the clump gets too big. Dividing your astilbe should be done in late summer or early autumn. To divide your plant, you need to carefully dig up the whole root ball getting as many of the roots as possible. Move the plant into the shade to prevent drying out. Gently separate the clumps of root that have formed around the main root crown. Usually there will be natural divisions, however, if the clump is tightly packed you may need to cut through the roots. Don’t worry about this damaging them, they will soon recover and will be healthier than before when they were congested. Each division should include a healthy section of root and foliage. Discard any roots that have no stems growing from them. The new plants can either be replanted in the ground (see Planting) or into pots ready for planting out in early summer of the next year. If planting several divisions at once, they should be spaced far enough apart to allow the roots plenty of room to spread. This will be from 1 to 3 feet (30-90 cm) apart, depending on the variety. Astilbes are usually healthy plants when grown in the right conditions. They are not particularly susceptible to pests and diseases. However, there are a few that can damage their health or even kill them off completely. If the leaves are speckled with a fine white powdery substance this is the fungal disease powdery mildew. You can help reduce the chance of this by providing good air circulation around the plants. You might need to thin the central stems or divide the plant. Once the plant has the problem, pick off affected leaves and apply a fungicidal spray to the rest of the plant. Dispose of the leaves in the rubbish, or by burning, to prevent infecting other plants. 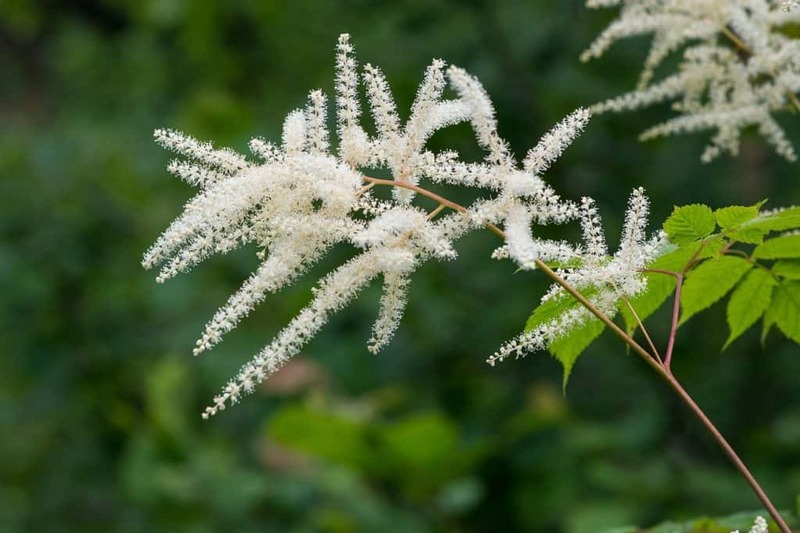 This is another fungal disease that may affect astilbe. It presents as small dead spots on the leaves. This infection most often occurs in hot, wet weather. Again, it can be treated with a fungicidal spray. If Bacterial Leaf Spot is present you will see brown or black spots on the leaves that grow in size. This disease is something that can be controlled but not eradicated. Cooper fungicides can help control the problem. As the damage is minimal some people just choose to live with the problem. However, the only way to get rid of it completely is to dig up the plant and dispose of it. You will also have to plant something that is not susceptible to bacterial leaf spot in its place as the soil will be infected. Astilbes are not affected by many pests. Rarely they may be attacked by the tarnished plant bug. Keeping the ground clear of leaf litter and plant matter will make sure these bugs have no place to overwinter. Encouraging beneficial wildlife can help with this as with many bugs. Q Why are there brown patches on the leaves of my astilbe? Brown patches on the leaves are often leaf scorch. Astilbes are a woodland or ravine plant and do not enjoy very high temperatures. While they will flower best with some sun, they do not like to be in constant sun and very hot afternoon sun will cause scorching. Your plant will benefit from being moved to a more shaded position to prevent this happening any further. Other potential causes of brown spots or patches on leaves are Cercospora leaf spot or Bacterial Leaf Spot (see Diseases). Q My astilbe won’t bloom. What can I do? If your plant is getting enough moisture it is likely that it needs more fertiliser to bloom well. A slow release fertiliser applied in spring should help. In addition, a relatively high-nitrogen fertiliser applied in late summer or early autumn will help the new flowers that are forming for the next year. The other possible reason for lack of flowers and general ill health is that the roots are overcrowded and the plant needs dividing. Q Why is my astilbe dying? One of the most common reasons for ill health in these plants is lack of moisture. They prefer their roots to be in moist, even boggy soil. This is why they do well near rivers and ponds. Try watering your plant regularly to see if this improves things. If your astilbe is planted in dry soil you might improve conditions with mulching. You might also consider making soggy conditions for them by digging a hole and lining it with plastic poked with small holes. Replant into this area and your astilbe will get more of the moisture it needs as the soil will be slower to drain.